Believe it or not, a lot of people are actually afraid to look themselves in the mirror each day. They're not all excited about facing their daily routines and responsibilities; managing to suppress their feelings inside, not giving themselves a chance to breathe freely every now and then. However when they start asking for help, they usually receive the same advice; "Go away, travel sometime, lighten up a bit, you need to change…" Nonetheless, no one actually helps them, only until they meet a wise man who would instruct them to start writing. Yes, to simply start pouring out what they have in mind, heart, and soul in papers to release the amount of pressure they are facing every single day. Consequently, this power of confession comes to their rescue. It revives their soul and helps them explore a whole new dimension of sanity, relaxation, and peace. But, some people use this power as their own profession. They practice it as a way of discovering the world, making a difference in one's life, or simply babbling about it for the fun of it. Shaymaa El-Gammal is one of those people who enjoy this power of confession. She goes with the motto of, "Don't Hide What You Are!" Her job as a writer has grown in her ever since she was a child, which encouraged her to start a blog and post her own ramblings to the world as well. Not having the difficulty to validate what she has in mind, she developed into a professional, daring, interesting Journalist and Media Consultant. Her writings are spontaneous, very enjoyable to read, and highly informative. We have come across her very own first book, "Ta2 Marbouta," and decided to interview her, so she can tell us more about her experience with publishing, writing, and self-development. Speaking about her own thoughts and revelations, or as we called it above "babbling," she managed to present her own "EAT PRAY LOVE" journey to us. Make sure you grab your copy; you will definitely find yourself in a chapter or two. Who knows, maybe it may encourage you to break-through your silence and start writing your own book someday. To check out her latest updates, go to http://www.facebook.com/Shaymaa.Gammal. · Please introduce yourself to our readers. I'm Shaymaa El-Gammal, 25 years old. I'm married and I have one kid called, Firas. I've graduated from the Faculty of Arts, Ain Shams University to work as a Tour Guide for a while. Then, I shifted my career to a Children Instructor when I came across Kelmetna magazine and started practicing my writing, which I neglected since I was 12. At that point, I regained my real passion towards writing, so I started working as a Journalist along Education. Now, I contribute in several publications, like Cairo 360, Al-Wafd News Portal… etc. I love music, reading, photography, food, and surfing the net. · What does the book talk about? It's a collection of my articles, ramblings, and revelations I've written since 2008 and till now. It presents several occurrences I've experienced, like the first time I fell in love, my marriage, the birth of my baby boy, the death of one of my friends/relatives, along with some situations I tried expressing my point of view through them. · What encouraged you to write? I started writing my diaries when I was around 9 years old; what I thought about some movies, songs I liked, famous quotes… etc. Having so much time on my hands, as I was brought up in Saudi Arabia, made me write; I disliked the loneliness. But then, I stopped at the age of 12 and started writing again for Kelmetna as I mentioned before. · What does your child, Firas, represent to you? Did marriage influence your writing by any means? Firas represents the future I'm living for. My world revolves around him and my husband. My marriage encouraged me to be more successful due to my husband's love and constant support. Of course, I had to turn down a lot of opportunities in TV and Journalism, but it's ok; it's never too late to achieve it later. · What made you decide to write a book? I took the decision when I read these specific books: "Rice in Milk" by Rehab Bassam and "Whatever You Think, Think the Opposite" by Paul Arden. Rehab taught me how to write about myself; how to be cosy, honest, and universal at the same time, while Paul introduced me to creativity, innovation, and breaking the habits writing/publishing. 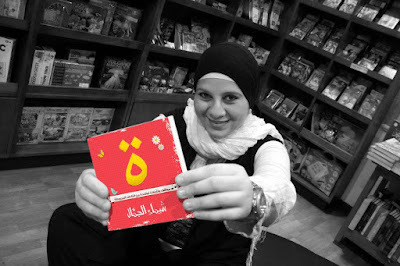 Also, Al-Shorouk publications stimulated my thought of working on my project, after I saw their successful experiences of turning several blogs into books. Usually ideas come to me whenever I witness any influential incident, read a book, or watch a video on YouTube… etc. Strangely, I feel the urge to write whenever I go to Virgin stores; its atmosphere urges me to pick a café afterwards and just write! · What's the difference between writing a book and writing on your blog? You don't have to think of the consequences when you write a new blog post. In other words, you are able to breathe, caring less about your writing style. On the other hand, writing a book requires solid structure, more vocabulary, and organization. You have to deliver a message, not just rant. · What's your parents' response after reading your book? Surprisingly, they respected everything I wrote and no one made feel bad whatsoever. · What's your life philosophy? As Fayrouz once sang, "I'm a humming bird… my people set me free to wander under the sun through endless roads…," I enjoy life, freedom, work, and the sun. My eternal daydream is to fly while sleeping. I love living as simple and as light as a bird. My motto is to accept all human beings just the way they are. · How do you picture yourself when you're 40? I think I'll gain weight, but I'll enjoy who I will become. I'll always feel I'm in my 20's. I'll refuse to wear high heels. I'll be writing a lot, and will have good fans too. I'll maintain my childish character with my kids. · What do you mainly focus on in your writings? I write what I feel; I do not usually seek to be funny or try to deliver what everyone wants. I am who I am, and that's simply it. · Do you think writers have a different personality? Is it true they live in their own bubble? Usually, a writer lives two lives; a public one and a secret one. He/she has to successfully separate both personalities to be able to get in touch with his/her inner-self. It's all about focus and control. A writer can be very shy and decent in real life, but may live like hookers on paper to engage with what is written. · To which extent stability is important to a writer and how? Stability is not essential to a writer; on the contrary, it's very damaging. It can kill any inspiration along the way. That's why, the best writings are produces in times of love, break-ups, giving birth to a child, divorce, death… etc. ; occurrences like these create amazing pieces. · What would you say to those who did not unleash their writing talents yet? You have got to release your souls and get out of your cage, that's simply it. And, here's a small tip for you; if you're not brave enough to write as a first person, you can always use a third person narrator. · It has been brought to my attention that you discussed loneliness in your book. In your opinion, how deep can it affect girls? Loneliness can turn a girl into a positive, creative artist. It can help her make peace with herself. On the other hand, she can become worse by all means; acting all differently and doing thing she's not usually satisfied about. · Clearly, it's demonstrated how much you love Fayrouz. What's the story? Including her unique voice, I feel she has sung to most ladies out there; encountering us in several emotional states. She's deep, thoughtful, calm, and not glamorous, which I strongly like about her. Fayrouz is an idol to me, like Guevara or Marlin Monroe to anyone else. · Do you believe in change? Indeed! Everyone changes as he/she becomes older. Man's relationship with God is a living proof of that. Writers need change in their lives be able to develop their writing styles every one and then. New experiences definitely revive your way of life and help you endure the amount of pressure you're going through any period of time.